I just wanted to put in a word for Episode #2 of the Space Task Force STFepisode2.mp3. 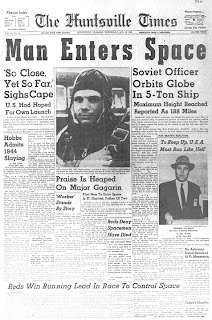 A lot of good information about Yuri Gagarin. Check it out. Here’s how The Huntsville Times reported the flight the day after the April 12, 1961 flight. Special thanks to Great Images at NASA for the image.